Occasionally in Toronto, one can find an original Queen Anne Style window in a Bay and Gable, or other Victorian, styled home. Apparently, improved glass making in the 1880s meant that designers could build larger windows with fewer small mullioned panes, however, mullions were still appreciated for their aesthetics. Queen Anne window style, the result of improved glass making, was a completely new style of window that did not exist in previous historic styles. At this time, public preferences and architect recommendation called for widows with divided, or “fancy top” upper windows and single full lower windows that would allow for unobstructed view while still maintaining the look of a divided window in the top pane. In different windows the divided lights march around the casement, allowing for a larger central window. 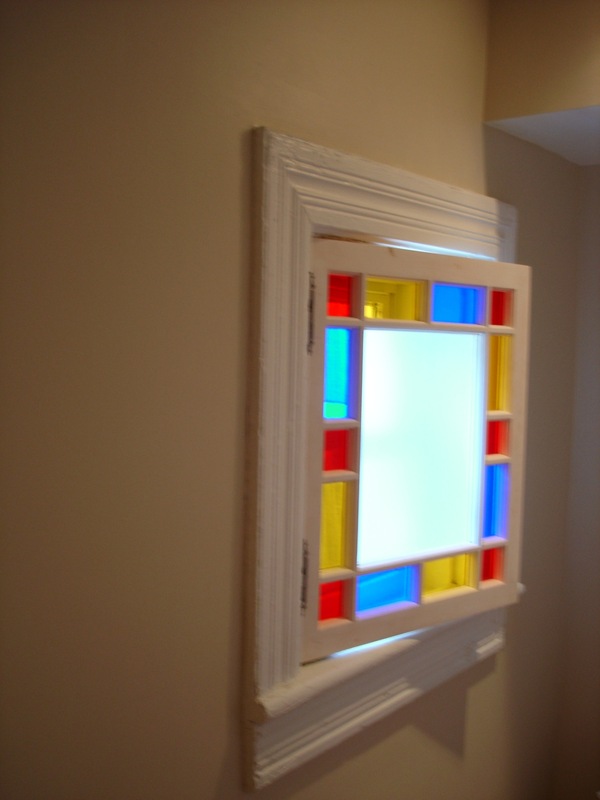 The look of multiple mullions of varying coloured antique or muffle glass can be very spectacular when sun shines from behind. Due to the era, these windows were largely installed in Queen Anne houses, from which they are named, but are also called “cottage” windows. This window style, the result of emerging technology, was a completely new style of window that did not exist in previous historic styles. One will need to find a good carpenter when trying to replace a Queen Anne window given the intricate mullion that comprises the panes. Luckily southern Ontario has many good carpenter that specialize in keeping alive the large Victorian housing stock in the province. Hoffmeyer Mills in Sebringville specializes in period millwork and made a perfect sash to custom specs. Glazing stained glass lights on a Queen Anne window requires a bit of knowledge of period glass used in 1880s windows. 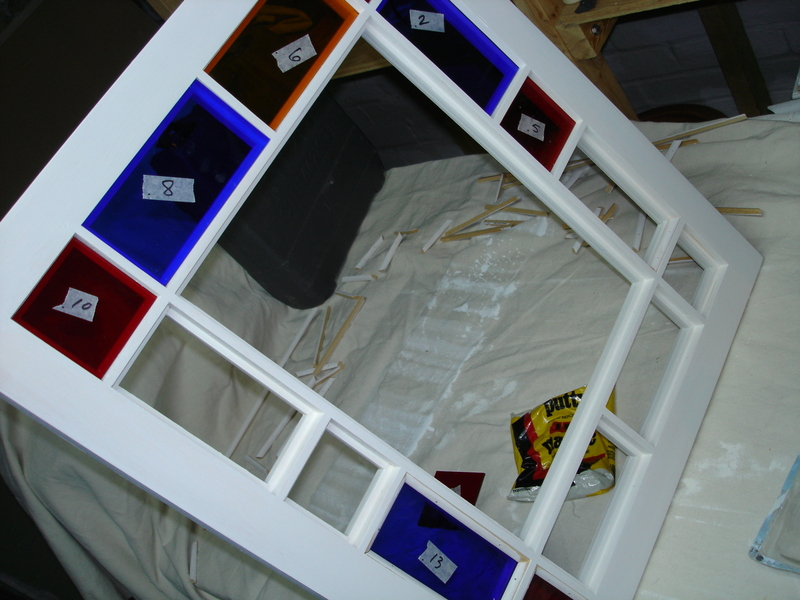 A local stain glass supplier was very helpful in locating the perfect classic Victorian cobalt, red and amber glass that was so often matched together in Queen Anne windows of the period. 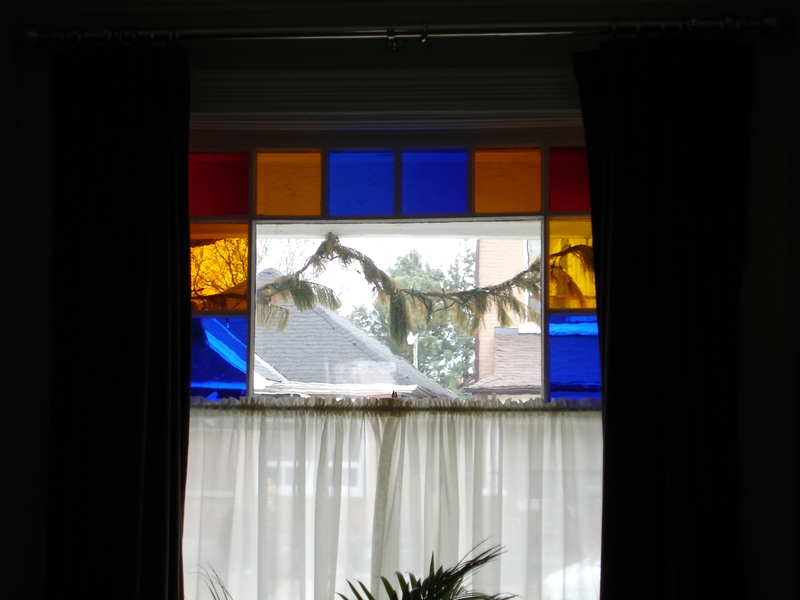 While the cobalt blue, red and amber was a popular combination, Queen Anne windows were glazed using multiple coloured and textured glass that was produced at the time. Reproduction “Antique Glass” can be purchases in varying qualities from mouth blown to machine rolled. In both cases, a glass that is dynamic and brilliant in light is produced. The high quality mouth blown glass is exceptionally brilliant given the random striations and swirls produced as the glass maker spins the glass to fabricate the panes. In many instances, other rolled textured glass, such as muffle glass, were used in these windows. 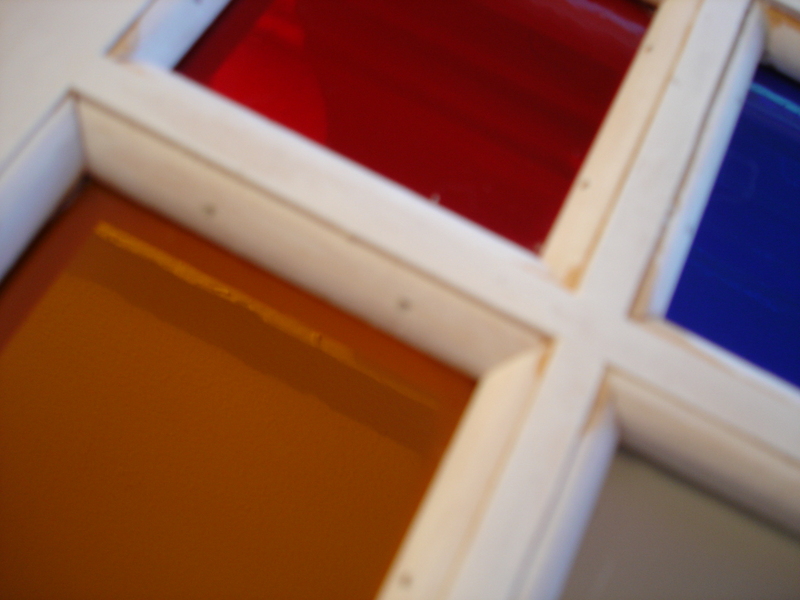 Individual panes can be either be secured with glazing points and putty or set in a small bead of putty and secured with small wooden stops. I would recommend using the wood stops since glazing points may be hard to secure given the small pane sizes and the increased chance of breaking a pane given that reproduction antique glass is more brittle. The final window was installed using four inch reproduction Victorian hinges and window hardware. A minor amount of wood planing was needed to get a snug fit in the window jam. Given that it was installed in a humid bathroom, it will eventually get a good coat of oil based paint. The original door on the house is a Queen Anne style that was unfortunately painted with the cheapest grade latex paint. 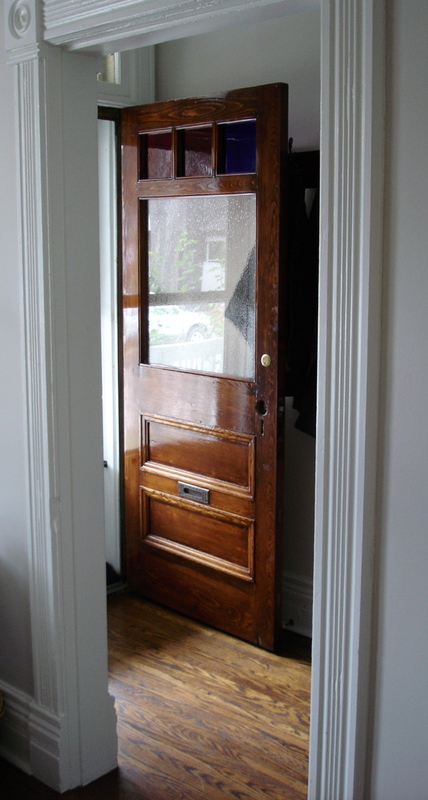 This style of door can be found on many late Victorian Queen Anne styled Bay-and-Gable homes in Toronto. After some research, Tung oil seemed like the the best possible finish. Stripping layers of paint off the door revealed a honey pine stain on the exterior and a dark reddish stain that is the base coat on all of the interior wood work. This dark stain was used as the base for the interior Victorian tromp l’oeil faux oak finish. Paint stripping was time and I am loath to even recall the ordeal. I discovered too late that a carpenter in the area would have been able to do the work at a reasonable rate, which I would suggest. Otherwise, you will be working with methyl chloride which is a very harsh chemical that is a VOC solvent and not terribly “green”. Of course, follow usual guidelines when you suspect lead paint (see post on refinishing hardware). More environmentally friendly chemicals should be used if you are lucky enough not too have too may layers to remove. I wanted as period a finish that I could achieve and that meant was very reluctant to use a polyurethane. The plastic coated look of polyurethane finishes are not very attractive to my eye. After some research, Tung oil seemed like the the best possible finish. Tung oil, the oil from a Chinese nut producing tree, has been used for centuries to water protect wood on Chinese sailing junks. The oil naturally polymerizes itself by linking up the molecules into chains creating a beautiful finish that repels water and allows the wood to breath. The finish is not “oily” in the least, is dry to touch and hardens to protect the wood. Best of all, with a light sanding, the finish can be touched up and renewed at any time. 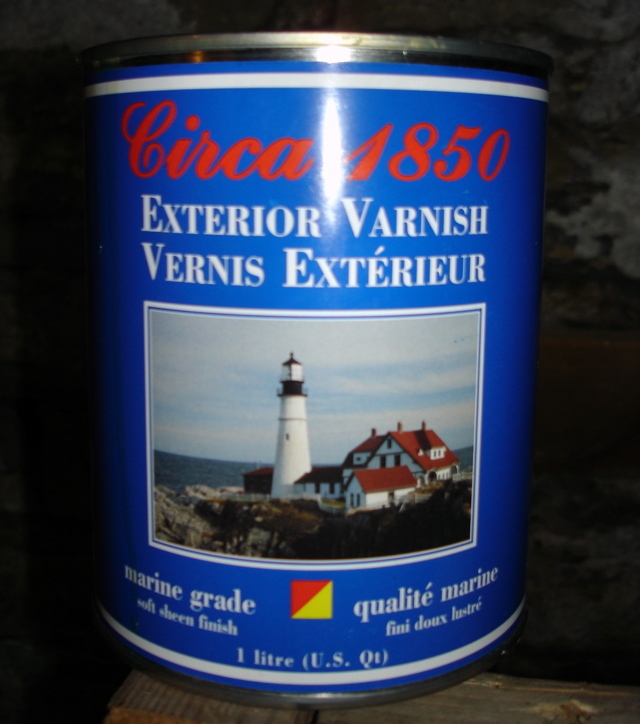 I used Circa 1850 polymerized Tung oil varnish. Polermerized tung oil has been heated to encourage even more molecular cross linking during the curing process and has been traditionally used a Marine Spar varnish on beautiful wood hulled power boats. Paint was removed using a few specialized scrapers for the moulding. Plenty of steal wool was used to remove paint and old varnish from the grain. This raised the grain of the wood which allows stain to be taken up. The door was sanded with 80 grit paper, then 120 grit paper, then 150 grit paper and finally 220 grit paper. The 120 year old door had an amazing heart pine grain. Since it was a soft wood, a coat of wood conditioner was applied prior to stain to ensure the stain was soaked up within the wood in an even manner. Three coats of stain were applied allowing 24 hours of drying between coats. Then three coats of Tung oil varnish were applied scuffing the finish with fine steel wool between coats. A visit to the Frick Collection in New York provided the inspiration for our choice of stain colour. Of course, I had to make this enterprize more difficult than it needed to be, but the hue of the stain was perfect, very warm and complemented the golden hues of the aged heart pine of my far more modest door. The result was better than anticipated and the stain and tung oil really brought out the antique patina of the aged wood. 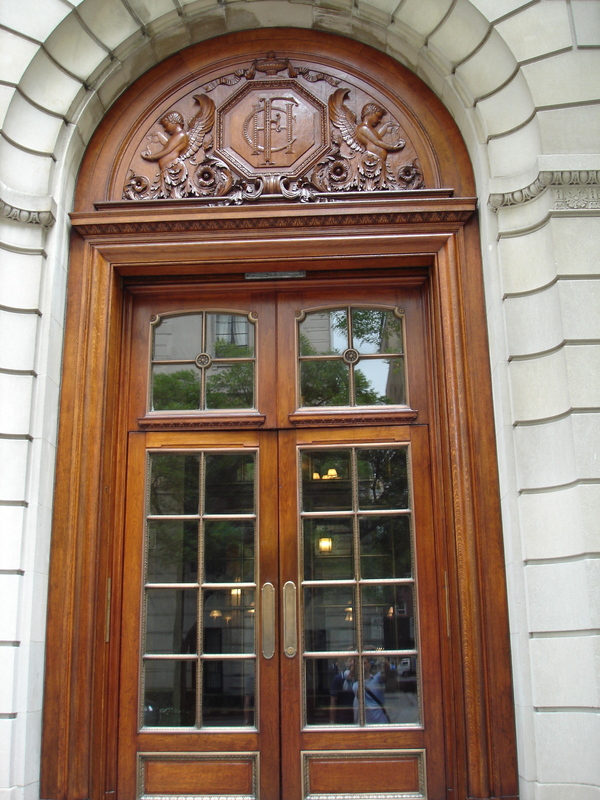 Antique front doors are a bargain at most architectural reclamation stores. 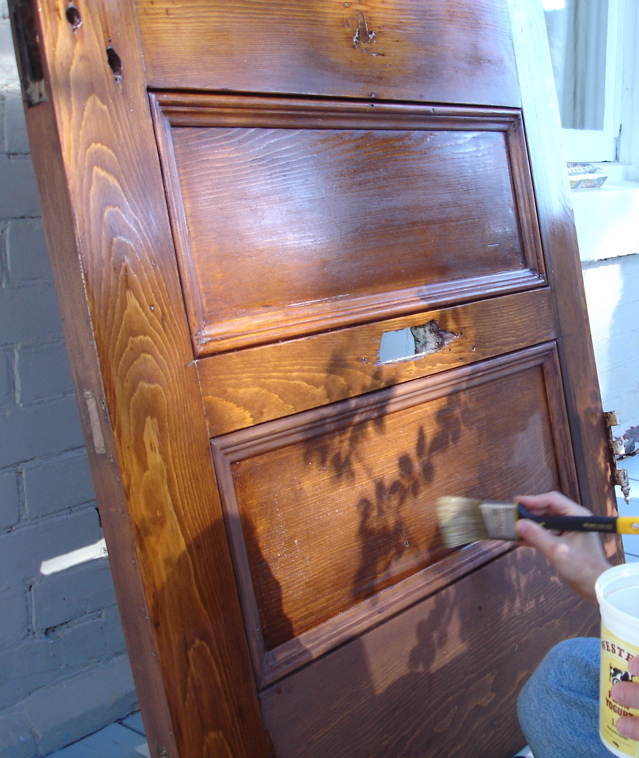 Partly because, many home owners are not willing to take the trouble to either refinish the original door or have a carpenter fit in a suitable antique period door. Nonetheless, the very minor additional effort is worth the results. A big box steel door on a period home is an act that frees space in hell for lost souls. 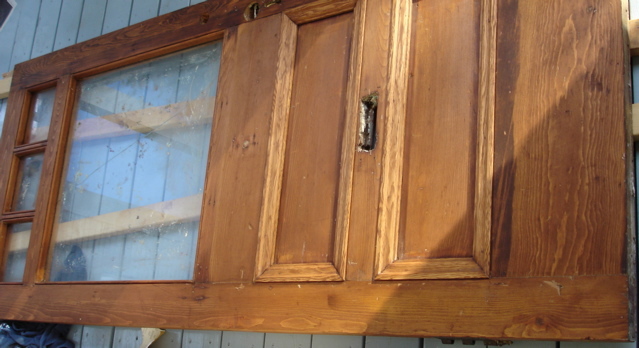 While I had the original door to work with, it can be great fun picking out the perfect door at your local salvage shop. Old windows are so worth saving and so much a part of a house’s style and character. energy effeciency. Civil engineers from the University of Vermont, The Vermont Energy Investment Corp., and the U.S. Army Cold Regions Research and Engineering Laboratory (James et. al, 1996) presented evidence that the savings of removing old windows and replacing with thermopanes is so small, that it may take over 80 years to recoup the investment – longer if the original windows are properly maintained. A well-maintained original wood sash or casement window with storm window offers many other advantages, including the ability to abate a larger amount of ambient and street noise due to the larger distance between each pane. Original windows will also last a lifetime if properly maintained. This justifies repairing the existing window when needed. Sedovic and Gottheif’s report (at traditional-building.com) addresses many of the overblown claims made by replacement window manufacturers and the advantages of well maintained historic windows. either, further detracting from the original character of your home. This is to say nothing of the fact that once you are on the “replacement window” schedule, you can expect to have to replace the thermopanes once the gas escapes and the moisture infiltrates the unit resulting in a lovely “fogged window”. I guess it is really not necessary for me to directly state my abhorence for vinyl windows, especially since the POs installed a couple of them. I can’t wait for a few of them to start “popping” so I have a reason beyond aesthetics to get rid of them and have custom antique sash windows installed. their work, using traditional mortise and tenoned joinery, was excellent. Given the ambient noise of urban life, I requested that the window be glazed with 4 or 5 mm glass. The mill requested specific measurements and it only took a small number of runs with the hand planer to get a perfect fit. I used a simple compressible foam weatherstripping and antique styled brass fasteners and interior latch locks to hold the window in place. The result is no drafts whatsoever and I cannot even hear a delivery truck rolling by while reading the paper. Well worth it. I wanted to put up bead board in a small laundry room, but lost enthusiasm for the project after realizing I would need to spend a couple of hours nailing boards over my head. So perhaps I did not really need a pneumatic Brad nailer, but now that I own one, I have tons of ideas for more projects! As if there were not enough items on our “to do” list. I choose a small room to gain some experience working with the nail gun. Paint or prime the beadboard first. This will ensure the tongue and grove of the boards are fully covered as it will be hard to get into any uneven joints once the boards are up. For this project, I used a lower grade pine that was meant to be painted. Using the nail gun will also ensure that you do not split boards and that you do not leave hammer marks or nail heads that need to be putty filled. To put up a bead board ceiling, I first used a stud finder to locate the ceiling joists and then snapped a chalk line to mark their location. The beadboard should be installed perpendicular to the joists so that you get solid wood stock in which to nail. It is recommended to leave around a 1/4 inch gap to account for expansion of the boards. This gap will be covered by your trim. If the beadboard is going to be installed in a humid room, then you may also want to back prime the boards so they are less susseccible to expansion. If your ceilings are not true (and chances are they arn’t true) then you may want to account for the irregularity to ensure that the bead will line up and run parallel with the trim molding. This room is a small “scullery” and I did not bother with the added fuss and the slight irregularity is not noticeable at all. The first board should be face nailed, but after that board I “toenailed” the boards to hide the nail heads within the tongue and grove of the beadboard. Some boards may be so warped that you won’t be able to use them on long stretches, but can be salvaged to work around light boxes. I tried to keep the alignment of the tongue and grove as tight as possible so there were no obvious gaps. Once it is all nailed up, then it is time to cut the crown molding. I thought this would be easy, but the experience brought back my regrettable experience of high school math. How to cut a mitered corner is a post in itself… there are some good guides online and your saw’s owners manual should give you the angle degrees you need for the right cut. Using the Brad nailer is fun, quick and easy, just do not forget the ear and eye protection. Beadboard looks great in an old house and gives it some Victorian character where there would otherwise be drywall.